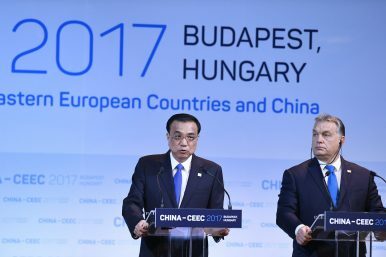 Hungarian Prime Minister Viktor Orban, right, listens to Chinese Prime Minister Li Keqiang while addressing a press conference during the summit of China and sixteen Central and Eastern European Countries (CEEC) in Budapest, Hungary, Nov. 27, 2017. Since 2010 with the election of the right-wing Fidesz political party, Hungary has even tried to shirk some of this western identity, with an eastward opening toward Russian strongman Vladimir Putin. Viktor Orbán, who started his political career by taking a brave stance against the Soviet Union, has lauded the illiberal nature of Putin’s regime and made it unmistakably clear that he wishes to build a similar regime in Hungary. As one of Putin’s biggest fans, Orbán has made for a natural partner within the EU for Russia. Economically, agreements such as the Paks Nuclear Deal have further entrenched this relationship’s legitimacy. Constitutional changes at the beginning of Orbán’s reign since 2010 have pushed Hungary further in this direction, along with staunch anti-immigration and anti-EU campaigns. While Hungary as a nation has long tried to reconcile an identity crisis akin to Dr. Jekyll and Mr. Hyde, Viktor Orbán has brought some consistency to the country. He has effectively achieved this end by dumping out Dr. Jekyll’s serum, trapping Jekyll inside Mr. Hyde for the foreseeable future. Russia is only one example of Hungary’s eastward opening as it turns away from the EU. Orbán has also reached out and developed a relationship with fellow strongman Recep Tayyip Erdoğan in Turkey. At an October 2018 meeting between the two in Budapest, not only did Orbán sing Erdoğan’s praises, but the two also expressed a desire for closer economic ties and possible defense cooperation. These factors already begin to answer to the question as to why Hungary so enthusiastically joined China’s BRI. Although these factors have been discussed in a relatively western context, they still apply. Hungary’s various identities make it a natural partner for China. First, their political identities are highly compatible. The earlier examples of authoritarian friendships left out the world’s most successful authoritarian regime: China. Like Russia and Turkey, then, a strong relationship with China makes sense for Hungary. What is also extremely beneficial for Hungary is that close ties to China ensure Hungary’s position in the world’s power politics. As a member state of the EU, plus a friend of Russia or a friend of China, Hungary has ensured its seat at the global table. These relationships are all robust as well. Even though Orbán has been in constant political conflict with the EU, its status as a member state is quite safe. Article 7 sanctions against Hungary are unlikely to result in any major punishments due to Polish and Romanian support of Budapest. Furthermore, Fidesz has not experienced any major punishment from its own center-right coalition in the European Parliament (EP). After a decade of illiberal policies, the European People’s Party has only recently suspended Fidesz’s voting rights within the coalition. This is a relative slap on the wrist and highlights the importance of power politics within the EP. The EPP would most likely be eager to take more significant action against Fidesz but does not want to lose the party’s votes in the EP. Russian support ensures that Hungary will have a friend in European politics for as long as Orbán remains in power, regardless of Hungary’s status within the EU. Furthermore, participation in the BRI ensures Hungary’s economic importance for the continent. Hungary therefore has become politically bulletproof, working within the margins of foreign affairs and securing its worth to both its detractors and its supporters. Hungary’s geographical identity also has important economic windfalls for Chinese investment: access to the European Single Market. This is consistent with Chinese trade in other Central and Eastern European states such as the Czech Republic and Poland in addition to investment in Romania and Bulgaria. Investment in Bulgaria and Romania is particularly of note, since they help finish the overland route from Turkey to Hungary and into central Europe. Furthermore, Hungary’s positioning as an Eastern European country gives it the advantage of cheaper labor and a geographical location closer to Beijing, while its western identity gives it the access to the Single Market the Chinese so desire. Interestingly, the Chinese plan for the BRI in Hungary does not seem to contain some of the debt traps that the BRI has enforced in certain areas of the world. Hungary’s access to the Single Market is more important than anything China would want to achieve through these debt traps. This exchange is not Faustian by any means either. China is not giving Hungary political legitimacy in exchange for economic benefits only enjoyed by China. The development of Chinese industry in Hungary will only help to grow Hungarian industry. As the Normandy of the single market, Hungary has been able to leverage significant investment from China as Beijing will attempt to economically invade the continent in the coming decades. However, China will not achieve this invasion militarily on the sands of France but will instead exploit the illiberal nature of a perfectly placed partner that is hungry for investment and powerful friends. John Macri is an affiliate of the University of Pennsylvania’s International Relations department with a focus on Hungary, Germany, and the greater EU. What to watch for as the premiers of China and Central and Eastern European countries gather in Sofia.